Need to exchange a layer of latex? This video will show you how. Michael discusses the origins of the Savvy Rest design as he demonstrates with a mini mattress. There are key differences between Dunlop and Talalay. This short video explains how each can contribute to your comfort. Dominick explains the differences between our mattress foundations options. Dominick demonstrates how easy it is to assemble a Savvy Rest platform bed insert. John and Liz show how easy it is to assemble the SerenitySpring mattress. Liz and Taylor demonstrate how to assemble an Esmont platform bed. Savvy Rest is a B Corp! Learn more about why we're proud to a B Corp. This trick will help you quickly and easily remove and launder your Savvy Rest mattress pad. 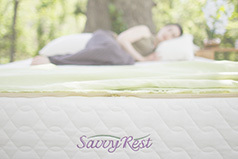 Molly R. explains how her Savvy Rest mattress alleviated her fibromyalgia pain. Informative articles about sleep, health, and natural living.